Well hello you lot! How are you this week? and I hope you had a great weekend? As you know, I’ve been off exploring in Mauritius as part of a press trip with James- I know, I’m a lucky ducky to be able to take him along to such lovely work things! Today’s post is all about what we got up to, discovered and where to stay; a travel diary of sorts. We were hosted by the incredible hotel brand, LUX*. They have three properties in Mauritius (amongst others across the globe!) and we stayed with two of them. The trip was split into two parts because each of the hotels had something totally unique to offer us as guests. We were to stay at the respective hotels for three nights each, but a cancelled flight left us a night short at our first hotel; SALT of Palmar. SALT opened its doors in the later part of 2018. It’s a place where exploration and discovery are at the heart of what they do, and in saying that, so are people; at SALT they understand the wealth in what we can teach each other. Staying with SALT means you’re ready for an adventure, ready to explore Mauritius and get outdoors! From visiting local villages to climbing a literal mountain, there is so much beauty to see, and culture to get lost in. There isn’t a detail untouched at SALT, from the cocktail menus to the products in your room there’s the joy of locally sourced product with a backstory- community helping community. It’s also a really uplifting and cool space to spend time in as Camille Walala deigned the interiors to match the Mauritian vibrancy and the colours she has used absolutely lift your mood. They’ve built a really special experience for their guests over at SALT, and the service from the staff matches. I’ll take you through what we got up to during our stay. We arrived bleary eyed at 3am post cancelled flight to the warmest welcome. The team showed us straight to the room and asked us if we were hungry as they would happily prepare something if we were. We politely declined as I think all we could see was bedtime! There’s no formal check in at SALT, which I love, it’s just a welcome drink, a chat and you’re shown to your room with no fuss. 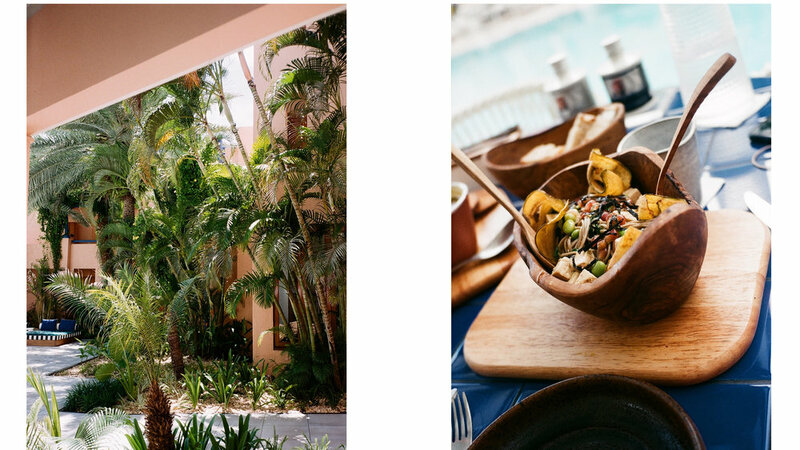 There’s one main restaurant, that caters for all meals, though the menu changes and you have the choice to sit inside, out by the pool or closer down to the beach so you can mix it up a bit! Everything we ate was incredible, fresh and imaginative. For breakfast I had a spicy egg flatbread that was exactly what my jet lag needed! Inclusive of coffee that is locally made. We were picked up by our driver to head off to the local village to see the vibrant central Flacq market- and it was a Sunday so it was crazy busy and fun! but also 1 million degrees…! The array of fresh fruit and veg was incredible, and not only that, there was a line longer than you might imagine for the islands best Biryani! we paid 40p for some fresh coconut water and took in the sights and smells. Driving through the villages was a great experience too, the colours in the architecture and the pineapple fields! Once we returned to SALT, we were ready for some lunch. We both enjoyed a big fresh salad and some grilled corn, and a beer which was exactly what we needed. We changed and headed to the secluded part of beach to a day bed where we both napped and took photos of how beautiful and serene it was before heading in to get ready for a beach bar drink ahead of dinner. Much like the way you can eat at a few different locations within the same restaurant, you can drink in this way too! They have three bars, the main bar, the beach bar and the rooftop bar which is pretty special. We both had an authentic Mauritian curry for tea and my goodness, we fell in love. The wine list is also pretty great, with the wine they offer made especially for LUX* hotels in Cape Town. It was a beautiful meal (and wine!). We started the day with another gorgeous breakfast before heading off out to explore again. First up we visited a dormant volcano site, and from the site you could see a panoramic view of the island and that was really special. Our tour guide told us lots of people go up there to propose! the mountains in the distance were incredible. Next on the list was a tip to The Sacred Lake. The lake, also known as ‘Ganga Talao’ is considered to be the most sacred Hindu place in Mauritius. It is truly beautiful, and vast! On the way back to SALT we stopped by the side of the road to pick some Goyava fruit to eat and for our tour guide and driver to put into salads at home. Next up was a spoiling treatment at the spa, located inside the hotel, SALT Eqilibirum. There aren’t any treatment menus, so they tailor the treatment to you, and each treatment starts with a relaxing foot ritual. I had a massage and my goodness I was half asleep during it, it was so deeply relaxing. Post treatment there’s a Himalayan salt room to sit inside for detoxification too, which is again, super relaxing and comfortable. For our final evening we had a date with the resident mixologist at the hotel who showed us how to make a couple of signature cocktails. I was hopeless at this task and was literally covered in mine! James did a great job though. We had dinner closer to the beach for our final evening, and finished with drinks on the beach by a fire which was a beautiful end to an incredible experience with SALT. Day three saw us move an hour across the Island to the Northern side to start our three nights stay at LUX* Grand Gaube. As we arrived, I can honestly say that just the entrance alone, that overlooked the turquoise hued sea, was enough to blow us away! I suppose the clue is in the name here, ‘LUX*’. What an incredible, luxury hotel this place is. You know the feeling that everything is taken care of? that if you were to ask for something, it’s already done and with no trouble at all? exactly that. LUX* Grand Gaube is one of the most outstanding hotels I have ever stayed with. Not to mention that Kelly Hoppen MBE designed the interior so you can imagine just how chic it is. The LUX* way of doing things is to help guests to celebrate life and turn the ordinary into the extraordinary, and they did just that for James and I. LUX* Grand Gaube is such a wonderful mix of well thought out sensory and indulgent experiences; from every room having an ocean facing view to snorkelling tours over beautiful coral operated by the boat house at the hotel; this hotel really do know what you want. The hotel is located on a secluded part of the island, making the beaches feel really private. It’s vibrant whilst peaceful and they’ve nailed the balance so well. We arrived to said grand and picturesque entrance to be greeted again by an informal check-in process, a cooling drink and a warm welcome. We checked into our room which was ocean facing, with a terrace and somewhere I instantly loved and felt very relaxed in. There are six restaurants to choose from at the hotel, and the PR Manager and our go-to for the trip, Elvis had put together the most amazing itinerary for us to get started. We ate lunch at the Creole Smoke House which is nestled in the adults only area under the trees and vines. We had a light seafood lunch and loved every bite! We had a really chilled day on our first day there and settled on the beach after lunch for a couple of hours. I was in and out of the sea the entire time because it was around 32 degrees and I was baking! Dinner was set on the most beautiful pier at the edge of the hotel in the Turkish restaurant, Bodrum Blue. Elvis the PR Manager joined us for dinner and drinks and we caught up on the trip so far and he recommended things for us to do and told us all about his interesting life growing up and subsequently, his career with LUX*. We had hummus, various kebabs and brilliant wine again (the same list as at SALT). Breakfast was at The Palm Court restaurant and the choice is absolutely out of this world. The set up is beautiful and chic as ever, ocean facing, and a nice breeze as you watch the tide roll in. Between eating, we spent our day swimming in the sea round at the adult only side of the beach which was heavenly. For lunch we had BB’s burger bar which again, and in no surprise, was amazing. A great menu and just a solid, tasty burger. We soon regretted the burger once we were on the boat to go snorkelling….it was choppy!! The boat goes for snorkelling twice per day out to an area of coral which is beautiful. The skipper did say to be extra careful as it was more rough than usual - I felt it was too! I got washed into the coral and cut my knee which hurt more than I would have imagined it might….que an infection and having it cut out the following day at the onsite infirmary (very handy for an accident prone woman!) It’s all absolutely fine now. Pre dinner we got to experience the G&T 100 bar, which is a gin bar that offers 100 types of gin. The dream! The best thing about this, though it has to be said, is Vish the mixologist. He is a force of nature, a shiny bright star of a personality and you cannot help but smile in his company. The knowledge and passion he has for gin is second to none. Self taught and everything is an experiment! He listens to the kind of drink you like and creates something bespoke for you- I’ve never enjoyed gin so much! We headed to The Palm Court restaurant again because we fancied another curry and it was every bit as beautiful as the last time we had one. Popadoms included. The whole deal! As you can imagine, I was beyond disappointed to be waking up on on the morning of our very last night at LUX* Grand Gaube. We had such a wonderful packed day for day 5, so that made up for it! It was our usual breakfast at The Palm Court, and and iced latte to go and explore. We had some beach time ahead of a one to one pilates and movement class with one of the onsite trainers. I was so excited as I was missing my pilates classes at home (not being at home, just exercising!). The class was amazing, and calm and difficult all at once and it was exactly what we both wanted and needed! After a good workout we both had appointments at the spa. The spa onsite is absolutely beautiful with options for massages, facials, manicure/pedicure and a Murdock London barbers for men’s grooming. James had his hair cut whilst I had a manicure and we both emerged feeling very pampered indeed. I met a gentleman at the spa who ws 102 years old, and is the oldest person living on Grand Gaube; because of this LUX* Grand Gaube invite him in for spa pampering sessions and to relax all day at his leisure, for free, because he is amazing. He blessed me on his way out of the spa! He was brilliant. Dinner was booked by Elvis for us at the Peruvian restaurant - this restaurant is usually chargeable outside of full board basis but we were very luckily treated to our meal as part of the stay. The food was absolutely beautiful, we took our time over 2 hours, ate slowly and appreciated every bite, right down the the churro’s for desert at the end of the meal. I wanted to do it all again once I’d finished! On Tuesday’s and Thursday’s there is an open-air cinema in the evening so we headed over to watch a film outside with some popcorn and a cocktail but James and I can’t speak French and it was in French, so we had a little laugh about it and went to the rum bar up in the tree house instead, which was very cool! We tried some local spiced rums and loved them. It was the best last night! We luckily had our room on late checkout because our flight didn’t leave until 22.40 so we had the whole day to relax ahead of leaving. James went to the onsite driving range (golf mad!) and I went to the gym and back to do some pilates. We spent the day at the beach, in and out of the sea and eating the amazing food (another BB’s burger!) before getting packed and ready to leave for home - very reluctantly! I cannot express what an amazing trip this was, and how much I would love to go back. Read more about SALT of Palmar here and LUX* Grand Gaube here.